Born in the slums of Liverpool, Victor Grayson spent time as a preacher, was wounded at Passchendaele, and shook the British establishment when he won the Colne Valley by-election as a socialist in 1907, age 25. However, Victor became most well known when, one afternoon in September 1920, he walked out of his apartment and disappeared, never to be seen again. 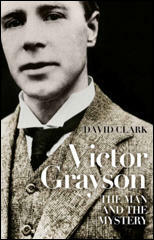 Author David (now Lord) Clark will share the mystery of Victor Grayson. Copies of his book, Victor Grayson: The Man and the Mystery, will be available for sale and signing. The Civilisations Festival is a ground-breaking collaboration between the BBC, museums, galleries, libraries and archives across the UK. More than 250 organisations in England, Scotland, Wales and Northern Ireland have signed up as partners.